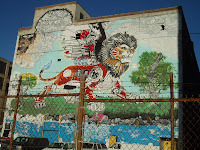 Detroit Video Daily: Russell Bazaar Lion Mural? Always on the lookout for murals in the city, this one off of the service drive of I-75 definitely is one of the best. After driving by on practically a daily basis, I knew I would need to eventually get out and see this mural up close. Because the Russell Bazaar is right next door I mistakenly thought that this mural was on their building. After some research i.e. googling, I discovered that it is on building 2 of the Russell Industrial Center. It's an awesome work of art, and my video doesn't do it justice. I learned that the artist who created the mural is Kobie Solomon and a story at Model D has some background information about the mural. In my ignorance I had been referring to the mural as a lion, when it's really a chimera. There are a lot of details in the piece that aren't easily seen as you drive by. One of the most intriguing is a head that shares two faces and is incorporated into one of the trees. I strongly advise stopping by and checking it out. If you want to see the photos that I used for the video, they are on the DVD Flickr page. As far as the music goes, I went back to Jamendo (which is definitely my favorite site to find Creative Commons music). I have no idea what led me to match up the pop sounds of Shanel's My Sunshine (chorus only) with the mural, but all I can say is the juxtaposition works. Furthermore, the fact that the photos were shot in November and I'm posting this in the beginnings of a cold December only make the irony that much stronger. Here is the link to the song, and it turns out that Shanel is not only a singer but a multi-media artist, scientist and more! Take a look at the about page on her website, and see that she really gives meaning to the word diverse. So that's the story behind the video! Great piece, but wow, it doesn't get much worse than that music. a lot of people don't notice that it is in fact a lion, but is made out of the 4 sports teams. The mane and face is the Lions, the body is the Pistons, the wings are obviously the Red Wings, and the tail is the Tigers. On top of all that, the gears on the top left have a demon inside it, the top left clouds have a big baby god blowing the wind, and the recently added water has the names of all the artists that worked on it. Thanks for your comment and observations about the mural! It really does have a lot of detail in it. It's still one of my favorite murals, for all of the reasons you've stated. 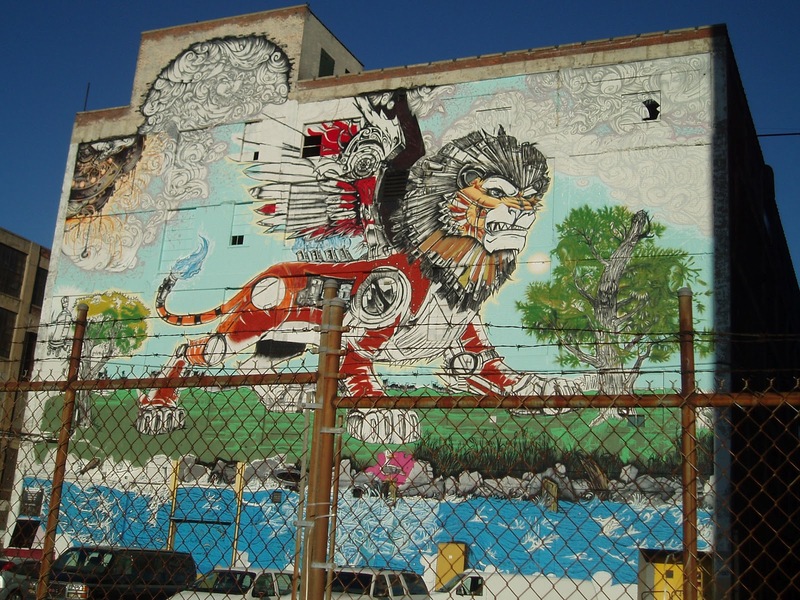 I always see that lion when we drive to the airport or going to spend the day at detroit that are is the coolest things about detroit it also explains the city as well.